If your referee is a no show on the weekend, you should try to text the NSYSA phone line: 604-363-1912 and avoid leaving a voice mail. Please send an email to nsysarefassignor@gmail.com after the game to report the No Show Referee. This way, we will have a record of everything for follow up action. 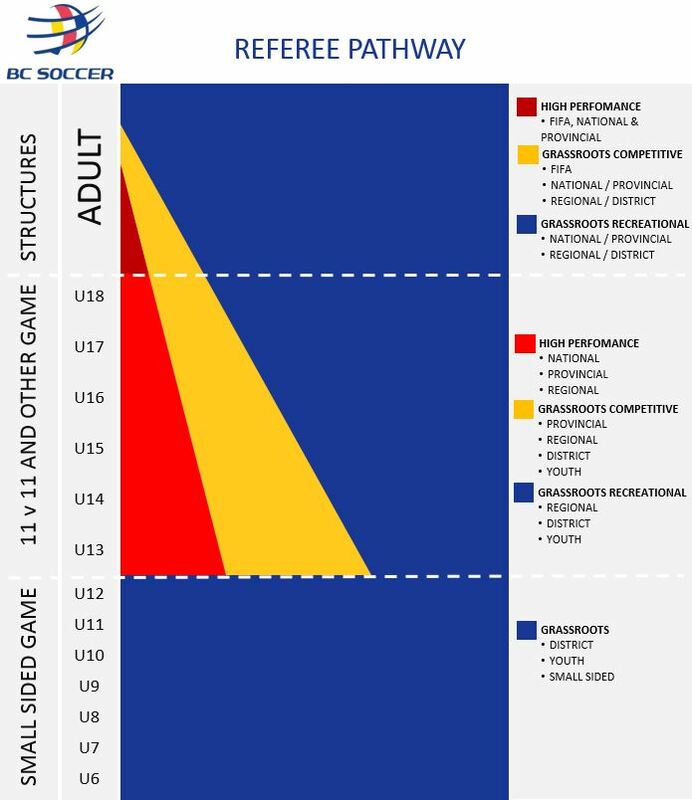 WVSC is part of the North Shore's excellent Referee Program, one that has been noted as the model for BC Soccer. The more we can nurture and develop young referees and support our senior referees, the better our overall soccer program will be for all. There is now an online form to enter Referee Performance Evaluations. Why stand on the sideline watching your children ref if you can AR or ref together with him/her and make some money at the same time. We already have father and son ARing together. We also have father center reffing with son doing AR. We too have father doing center reffing with both children as ARs in the same game. It really helps in terms of developing the bond among the family members and helping the children to accelerate their referee development as they have their dads to bounce off ideas with and asking for advice. If you have reached ï¿½middle ageï¿½, you probably realize that your clothes are shrinking. Unless you make a conscious effort to remain active, you will find your clothes shrink even faster. However, when you become a NSYSA referee, you will start feeling healthier and more mentally alert. There is no exercise more enjoyable than trying to keep up with a dozen kids running up and down a soccer field chasing after a round object. You will enjoy being the most knowledgeable person on the soccer field! There are only 17 laws (rules) that you can easily learn. Fortunately for you, most of the parents have not bothered to learn them, so you are always ï¿½the smart oneï¿½ on the field. Law 5 says you are always right anyway. However, be careful, after you leave the field and go home, your spouse may have a different idea about you being right all the time. When you become a referee, other myths are dispelled for you. Myth: Girls can't be referees. Fact: They make great refs. Many of our Small-Sided referees (12-14 years old) are girls. 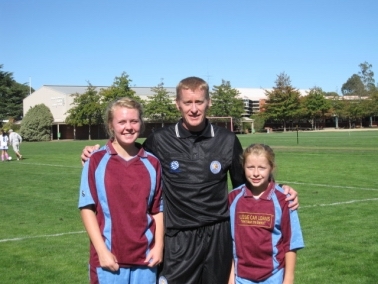 Both of our Referee of the Year 2008-2009 (Small-Sided) winners are girls. Myth: You have to be in great shape. Fact: The better shape you are in, the more you will enjoy the game, but you can do it now! Myth: The parents and coaches are onerous. Fact: Well, actually that is generally true but the good news is that like the kids, you generally find them easy to ignore. Myth: The game is complicated. Fact: The game is easy and the trainings take only 10 hours. Myth: You have to be young. Fact: The oldest ref we have in NSYSA is in his 70's. Myth: You can't do it. Fact: That is just total fiction. You will have a great time! Guaranteed!! As for your children, refereeing is one of the best ways for them to develop their self-confidence, time management, goal-setting, leadership and decision making skills etc. All of these skills will help them to be successful in life no matter what they end up doing when they grow up. Besides, they can earn 4 credits towards their high school graduation while refereeing. Our most active Small-Sided referee earned over $1,500 in the 2008-2009 season (it looks like this record will be broken this current season). Not a small change for a 13 years old and a clear demonstration of what she has learnt about commitment and determination. Please find a link on CSA’s “Insulin Pump Policy” for players. This policy will help both Referees, Players, Coaches and Parents when dealing with players who use an Insulin pump while playing soccer. This policy is located on the BC Soccer Website with other CSA policies at the below link. For any clarification please contact your Referee Development Officer or Head Referee.